Human interest in the future can be traced back to prehistoric times. People have always wanted to see what can happen in the future. The future is unknown and mysterious. People have always tried to solve the mystery of the future by using different ways for profit, fame, power or just curiosity sake. Today forecasting is a multibillion dollar industry. All economic publications publish many economic forecasting studies; political writers proclaim on political trends and forthcoming government policies; stockbrokers and financial experts predict stock market trends, when to buy, and what stocks to choose; and many other examples can be given which have application to other fields. Before making plans or making decisions, an estimate must be made of what conditions will exist over some future period. It is a well-known fact that there is uncertainty about the future. In order to predict to future by dealing with this uncertainty, forecasting is performed. At the present time, forecasting is a challenge which has to be overcome in many fields of application. Forecasting can be considered as a process of using various tools and techniques. Many methods for forecasting the future have been proposed in the literature over the past few decades because of the importance of this popular topic. One way to forecast the future is to use time series analysis. There have been many time series forecasting approaches in the literature. It is possible to divide these approaches into two subclasses which are conventional and advanced forecasting methods. Since conventional approaches such as Box-Jenkins methods has some restrictions such as some assumptions, they cannot always produce reliable forecasts for real world time series. Furthermore, conventional approaches cannot model some real world time series because of the specific characteristic of data. Advanced methods such as neural networks, fuzzy time series, or hybrid approaches have been recently used in many applications in order to deal with these restrictions arising from conventional methods and to get more reliable forecasts. Most of the time, these approaches have been competed to each other. On the other hand, it should be noted that these approaches are complementary rather than competitive. For example, hybrid approaches are very effective forecasting tools. And, these approaches sometimes combine conventional and advanced forecasting methods. 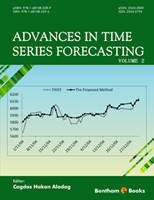 The book intends to be a valuable source of recent knowledge about advanced time series forecasting techniques. New capable advanced forecasting frameworks are discussed and their applicability is shown. The book includes applications of some powerful recent forecasting approaches to real world time series. Besides recent advanced forecasting methods, new efficient forecasting methods are firstly introduced in the book. The readers can find useful information about advanced time series forecasting, as well as its application to real-life problems in various domains. I hope the materials covered in this book, provided by the respectful scholars in the field, motivate and accelerate future progress and introduce new branches off the time series forecasting. In Chapter 1, Aladag and Turksen have introduced a new performance measure by defining a novel distance measure to evaluate forecasting performance of fuzzy time series. Bas and Egrioglu, in Chapter 2, have suggested a novel fuzzy time series forecasting approach that has a network structure. In Chapter 3, Zarandi et al. has discussed some Type-1 and Type-2 fuzzy time series forecasting models. Chapter 4, by Egrioglu et al., introduce a new neural network model including deterministic trend and seasonality components. In Chapter 5, Yolcu has presented a fuzzy time series method based on genetic algorithms. Aladag and Guney, in Chapter 6, have applied a fuzzy time series forecasting model based on Markov chain transition matrix to stock exchanges. In Cahapter 7, Yolcu has proposed a new high order multivariate fuzzy time series forecasting model. Chapter 8, by Dalar et al., has discussed a framework for using fuzzy functions in fuzzy time series forecasting. Sarica et al., in Chapter 9, have introduced Recurrent ANFIS model for time series forecasting. In Chapter 10, Bas has proposed a hybrid forecasting approach which combines genetic algorithms, differential evolution algorithms, and fuzzy time series. The editor would also like to express his sincere thanks to all authors for their valuable contributions. The editor would also like to acknowledge valuable assistance from Shehzad Naqvi from Bentham Science Publishers.